Facebook and Instagram ads have led the way in generating online ecommerce sales over the past few years due to their ability to be highly targeted to specific customer audiences. However, the importance of organic marketing and SEO has grown significantly as well as and many ecommerce entrepreneurs aren’t taking advantage of the free traffic search engines provide. What if we told you there was a way to not only bring in highly targeted customers for free, but that you can do it consistently by putting in a little extra work into your website? As an ecommerce entrepreneur you’ve probably given SEO a thought or two and you may have even implemented a couple SEO tactics already. This guide will take you through the most important SEO aspects you should be incorporating on your ecommerce website from content and keyword research to technical issues that prevent your website from being crawled properly. After reading through this guide you should have a solid understanding of how SEO works, its tremendous benefits and why it’s so important to do properly. We’re assuming you’ve heard of SEO before so we won’t dive into the details and history of it. However, many will tell you it’s about boosting your rankings on popular search engines like Google. Although technically true we like to think about it a little differently at Sourcify, and instead of focusing on the rankings we focus on providing value to our potential customers. What does that mean? Simply explained, people use search engines to find answers to their questions, like “What’s the weather going to be like in Ibiza on Saturday?”, or more commonly for our purposes here “Where can I find a pair of woman’s ruby red slippers?”. They may not type in those exact questions, but that is their intent. Focusing our SEO strategy on answering our customer’s questions (even before they’re officially a customer) helps us create content that they actually want whereas if we focused on rankings we may lose sight of our ultimate goal which as we said is to provide value to our customers. The problem with focusing on rankings is that you’ll eventually succumb to the scummy tactics to rank higher, faster. It works temporarily until the next algorithm update and then you’ll be forced to start all over again (if you haven’t been penalized). It becomes an exhausting battle that you’ll never be able to win or build a successful business on top of. With that said, this guide takes the approach of “What’s best for the customer” when discussing SEO tactics so that we never have to worry about future algorithm updates. Customers and search engines both need content in order to understand what your website is about. Content can be anything from blog posts and product descriptions to product images and videos. In order to do well in terms of SEO you’ll need to create great customer focused content that’s also easily digested by search engine crawlers. In this guide we’ll focus on the content you would typically find on individual product and product category pages: titles, descriptions, images, and internal links. There are many ways to create content, but creating the right content takes some experimentation and research. We, at Sourcify, like to take a look at our competitors and the terms they rank for before anything else. Established competitors typically optimize their content to meet their customer’s expectations. If the competitor has been around for awhile they’ve probably reworked their product-based content quite a few times in order to get it just right. Use their experience to save yourself some time when creating your own content. We like to use a tool called SEMRush, you can test it out for free, but if you plan to use it for anything useful it’ll cost you $100/mo. for the basic package. We highly recommend it. SEMRush provides an entire suite of tools, but for our purposes in this guide we’re only going to focus on one of their offerings. The Organic Research tool provides a list of all of the keywords your website or your competitor’s websites rank for. It can show you the exact terms your competitor’s customers are using to find your competitor’s product pages in search. For our example let’s say we plan to sell bracelets similar to Pura Vida under the brand name of “Awesome Bracelets”. To get an idea of the terms Pura Vida’s customers are using to find their products we’ll do some research on their product pages. 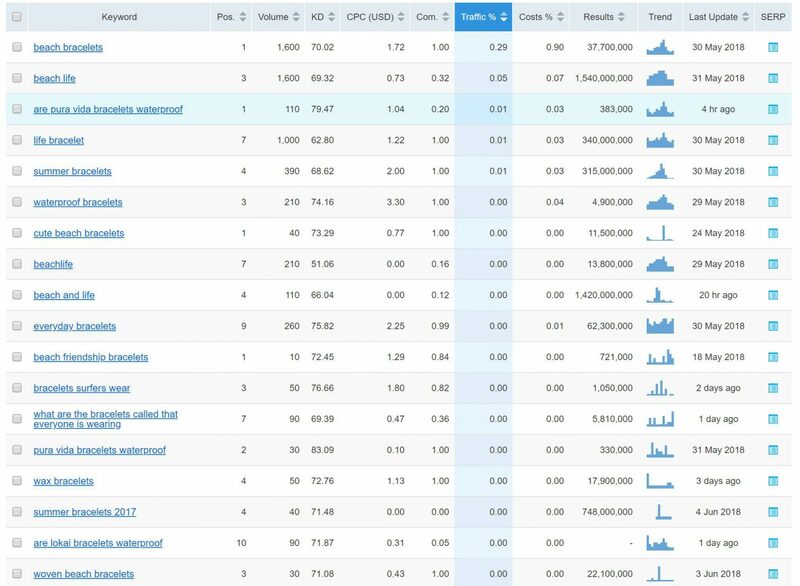 Below is the keyword ranking data from Pura Vida’s Beach Life Bracelet product page provided by SEMRush. As you can see that particular page ranks for a variety of terms (232 to be exact). Some are branded terms whereas others are long-tail terms like “woven beach bracelets”. Branded Pura Vida terms aren’t something you’ll want to rank for (unless you’re a reseller) so the terms to pay attention to here are the long-tail terms. Pos. is Pura Vida’s rank position in Google for that particular keyword. Volume is how often people search for that term in Google per month. KD is Keyword Difficulty which means how difficult it is to rank for that term on a scale from 0 to 100, 100 being the hardest. For simplicity’s sake let’s say you’re selling a similar beach-style bracelet. 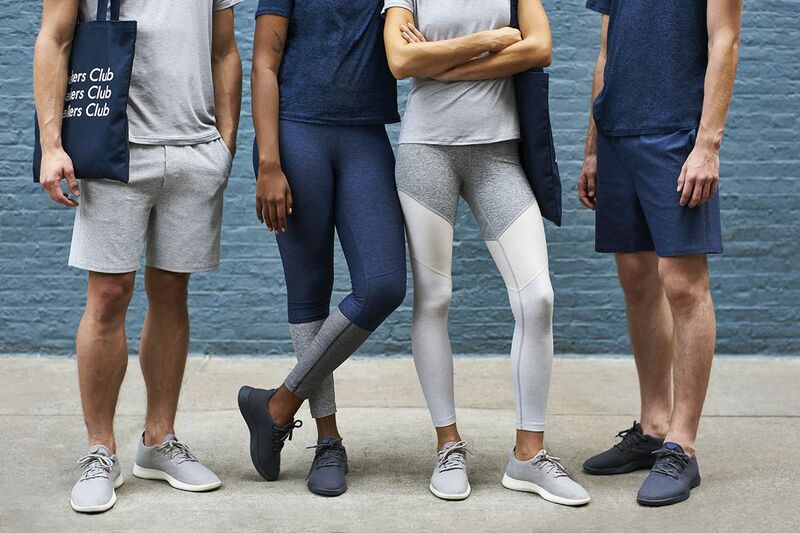 Based on the terms in the image above, you’ll want to jot down things like “woven”, “beach”, “summer”, “surfer”, and “waterproof” to form your own product titles and descriptions. They accurately describe the hypothetical beach bracelet we sell. They all have “medium” levels of keyword difficulty, which means they won’t be too hard to rank well for and we can assume they convert fairly well (otherwise no one would attempt to rank for them and their difficulty scores would be much lower). “Beach”, “Summer” and “Surfer” terms help us create a story around the type of lifestyle people who wear these bracelets live. The beach terms also produce a lot of monthly search volume and lots a volume means lots of potential customers. “Waterproof” and “Woven” terms give us features to sell and have good supporting search volume. When crafting your titles and descriptions remember that good SEO is just as much about branding and imagery as it is about ranking well for quality terms. Now that you’ve identified a handful of high quality keywords you’ll want to use them to form a title and description that will appear in the search results for your product. Would be a good title to use in order to rank for the terms Pura Vida’s customer are using to find their products. Note: You do not need to include the exact keywords from the SEMRush ranking data, Google and other search engines understand the relationships between like-terms. Additionally you’ll want to use some of those terms in your product description as well to fully sell your customers and search engine crawlers on the product you’re selling. Designed for surfers and the summer beach lifestyle, the [Your Bracelet Name] is a completely waterproof and totally unique bracelet woven together using ethically sourced materials and dyes from Costa Rica. Would work well in educating your own customers but also help you rank for terms your competitor’s customers are using to find a product to purchase. Designed for surfers and the summer beach lifestyle, the [Your Bracelet Name] is a completely waterproof and totally unique bracelet woven together using ethically sourced materials and dyes from Costa Rica. Shop our large selection of beach bracelets now! Before you publish a new title and description you should always test it with a tool like the Google Search Preview Tool. As you can see, using a tool like SEMRush will help you cut down on your keyword research by providing the exact terms your competitor’s customers are using right before they make a purchase. No longer will you need to guess which terms work best to describe your own products. If your competitors aren’t selling the exact products you’re selling and you need some new keyword ideas for your titles and descriptions we recommend using tools like Google Keyword Planner (you’ll need an active AdWords account) and Keyword Tool. It’s no secret that high quality images help sell products, especially online, but we often forget about the search engine crawlers when we upload our images. Not only can they not actually see images, but they also have limited crawl budget and if your product pages feature big images crawlers may start ignoring the rest of the content on the page because of their limited resources. What is crawl budget? Simply put, when search engines crawl your website they set data budgets depending on how large and popular your website is. If you have a tiny 5 page website your crawl budget is going to be much smaller than say the crawl budget of Amazon’s website. Crawl budget tells search engine bots how much data they should crawl before moving on, if your website is not optimized bots could be crawling all the wrong things without ever indexing the good stuff you want the world to see. Now that we have a basic understanding of crawl budget what does that mean for us? Product pages typically contain a lot of high quality images as they should, high quality images tend to convert much better than fuzzy low quality images. The problem with high quality images is that they typically come with larger file sizes and large file sizes eat up your crawl budget. How do you get around this issue? First, make sure the actual pixel width and height of your image isn’t massive. For most platforms an image size of around 1024 x 1024 pixels at most should do just fine. Next, make sure your images are around 72 – 100 dpi; website images don’t need to be print ready which is typically around 300 – 400 dpi. Finally, save your image as a JPEG at ~85 quality. When it’s all said and done your images should be around 100 – 200kb in size. Taking it a step further, you should also use caching to limit the number of objects your customers and search engine crawlers need to load up on their own. Caching will greatly reduce page load times which has been shown to increase conversions. Now that your images are of good size, it’s time to add ALT attributes to each image. The ALT attribute allows search engines to read a description of what the image contains (since they don’t have eyes…yet). These can typically be added to your product images directly within most ecommerce platforms like Shopify, but if that’s not the case and you need to edit the actual code of your images to include an ALT attribute you’ll need to insert ‘alt=”example alt text”’ within your <img> html tags. A good ALT attribute accurately describes the contents of the image instead of purely focusing on keywords; however, you will want to incorporate some of the keywords we listed before to make sure you reinforce the terms you’re targeting. Although “Beach Life” is the name of the bracelet we recommend adding a little more information to help crawlers accurately identify the image. Gives crawlers a little more context to work with to help them properly index this page and image. You’ll want to create unique ALT attributes for each product image on your product pages to get the most out of your SEO efforts. Search engine crawlers use links to crawl through your website, if your pages are not linked to internally then they may never end up being crawled at all. Remember when we discussed crawl budget? A great way to help crawlers save budget and time is to provide them with links to all of your pages so they don’t have to find them themselves. There are a few ways to do this, but since we’re focused on product pages in this guide we’ll stick to a couple easy-to-implement tactics for now. 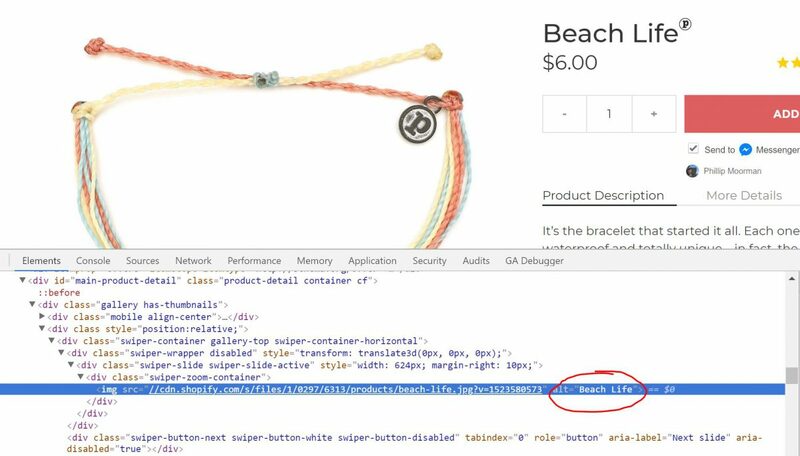 These breadcrumbs allow users to go back to the original bracelet collection where they found this Beach Life model. 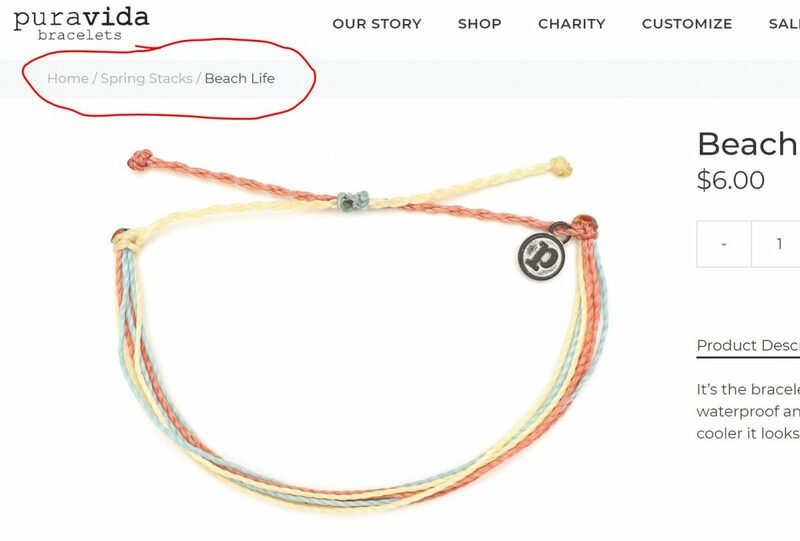 They also allow users who land on this product page from search to find similar bracelets to this one by clicking the “Spring Stacks” link. And lastly, bots can crawl through those links to find all of the other related products, which I’m sure Pura Vida appreciates. Most ecommerce themes for BigCommerce, Shopify, WooCommerce, Magento, etc. include built-in breadcrumb features, if that’s the case for the theme you’re using make sure breadcrumbs are turned on. If the theme you’re using does not include breadcrumbs you can find plugins to implement them. The product description section is a great place to include links to similar or add-on products your customers might be interested in viewing. Don’t overdo it though and stick with 1 to 2 links at most. You want customers to find additional products to buy without being overwhelmed with options. Links in your description, as you’ve probably guessed, also help bots find related product pages on your site to index. A majority of ecommerce sites now include “similar products” or “add-on product” sections at the bottom of their product pages to introduce their customers to additional options. These features can be a great way to introduce bots to other product pages on your site as well. Some themes will include sections like this by default, but if that’s not the case there are plenty of plugins that will help you achieve this as well. Many platforms offer the option to input product tags and category information on the product pages themselves. These are often turned into links to similar products using the same tags and categories. This can be a good way to help customers find similar products and help crawlers crawl your site faster. Product category pages can be very useful to your customers if they’re put together properly. 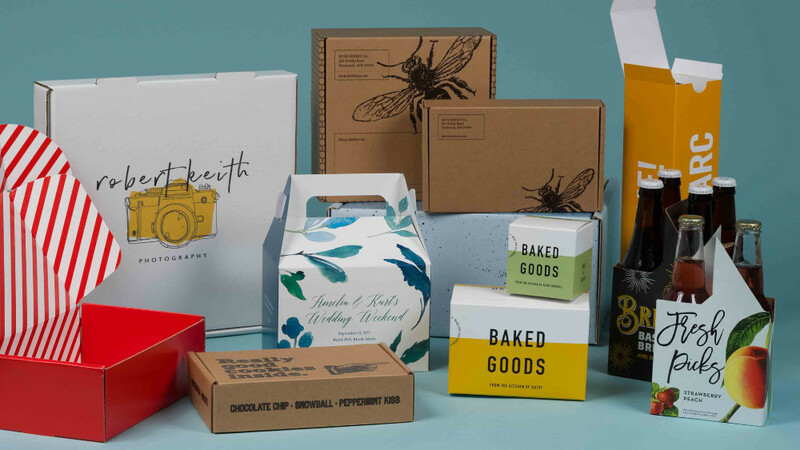 All too often people get lazy with their categories and end up listing a variety of products that are loosely related within a single category. From a customer’s perspective it can be challenging to quickly browse for a specific type of product. If you’re using category pages (you should be) then you want to make sure they’re focused enough to be useful. As an example, let’s say we sell 3 types of bracelets: leather, braided and woven for men and women. This not only makes it easier for customers to browse for a specific type of bracelet, but it helps search engines accurately index these pages. If you combined both Men’s and Women’s bracelets into a single category it would be difficult to describe the page and pretty annoying if someone was only looking for Women’s bracelets. The goal is to make sure that the people landing on these category pages from search are shown the exact products they’re searching for. Each additional step you put in front of the customer before they can browse through your products tremendously increases their chances of leaving. Depending on the theme you’re using you may be able to add a short description at the top of your category page. This is extremely valuable real estate that you should be using to describe the page. A description like this helps sell the customer further on the idea that our bracelets represent a certain lifestyle and to be truly apart of that lifestyle you need to wear our bracelets. It also gives search engine crawlers a better idea of what’s being sold on this particular product category page. Optimization #2: Thumbnail Images Should be Smaller! A lot of times a theme will use the main image you uploaded for a product page as the thumbnail on a category page. Which is convenient, but the problem is that the image you uploaded to use on the product page is much bigger than necessary to serve as a thumbnail image on a category page. If it’s possible, upload a smaller version of your main product image to serve as the thumbnail on the category page. A 500 x 500 pixel image should be fine for most category pages, but it depends on the theme you’re using. Remember, images should be twice the size of the space they will be shown in to maintain their high quality appearance on HD screens. Overall, category pages should be simple and to the point. The purpose of a category page is to allow your customers to quickly browse similar items so that they can find the ones they want to purchase without having to visit each of your individual product pages. Bottom line, keep it simple. Technical SEO over the years has become more important as Google and other search engines have given preference to websites that load quickly and without errors. Optimizing the technical aspects of a website can be a little more difficult than on-page optimizations like writing high quality content, but the benefits are tremendous. In the remainder of this guide we’ll help you discover a few items you can implement with limited technical knowledge. Before we dive into specific tactics it’s always good to get an overview of how your site is performing currently. 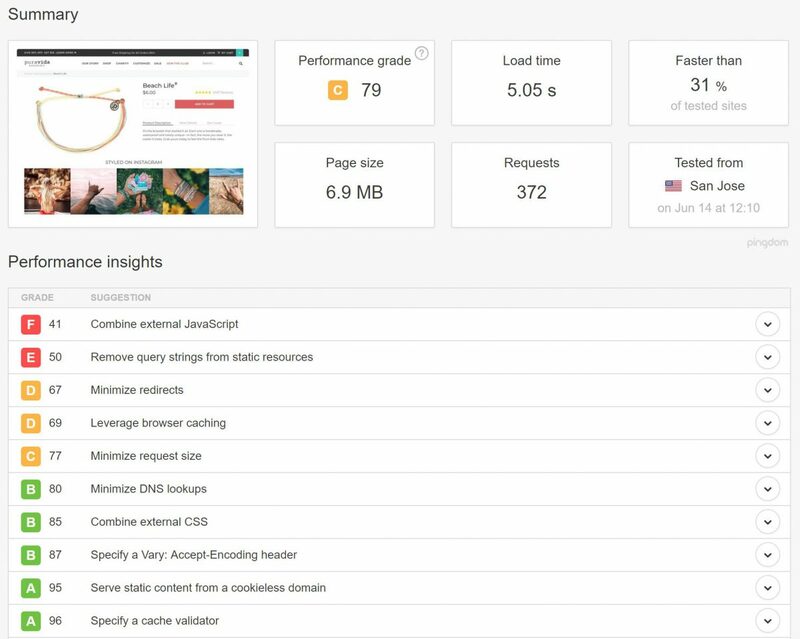 Tools like Pingdom’s Website Speed Test Tool can help you discover your website’s technical shortcomings rather quickly. As you can see Pingdom provides a variety of stats to help you see how your website compares to others. In this example, Pura Vida’s product page is only faster than 31% of other web pages out there and it took a little over 5 seconds to load. Not terrible, but not that great either and with some optimizations and a reduction in page size they could cut that down to a 2-3 second load time and improve conversions by 10-20%. Below the main stats Pingdom also provides color-coded items that need to be optimized. Red items need the most attention and Green items are pretty okay as they are. Clicking the dropdown button to the side of each issues shows a more detailed description and even the file paths that are causing the issue. Sending this data to your development team will save them a lot of time when addressing these issues. 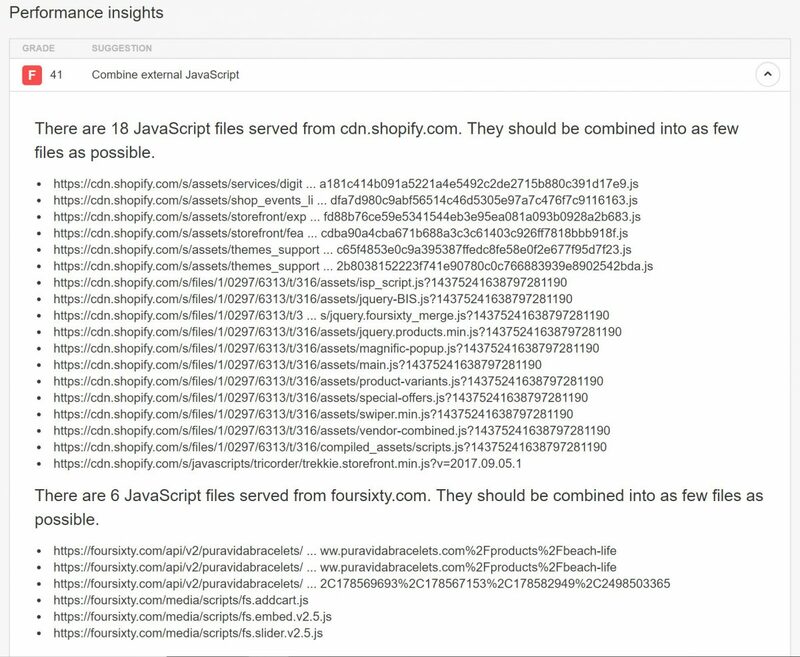 Unfortunately, in this case optimizing Shopify’s JS files is out of our hands, but this gives you an idea of the kind of data Pingdom provides to help you fix technical issues slowing down your website. Many of the items listed by Pingdom are slightly out of the scope of this guide, especially since the focus of this article is to help you implement the easiest and most beneficial SEO optimizations without having to rely on advanced technical knowledge. However, we recommend that you run your website through Pingdom to find any major technical issues that you can bring to your developers. Search engine crawlers (robots or “bots” for short) are willing and able to follow your orders if you give them some. How do you do that? With a robots.txt file of course! A robots.txt file is a simple text file uploaded to the root of your domain. It’s used to Allow and Disallow URLs the bots can crawl and it also directs them to your XML Sitemap (we’ll discuss this in more detail later). If you’re using a hosted platform for your ecommerce store like Shopify then you’re all set since Shopify provides this file for you, unless you need to make some customizations. If you’re using a custom ecommerce platform or something like WooCommerce then you may need to create this file on your own. 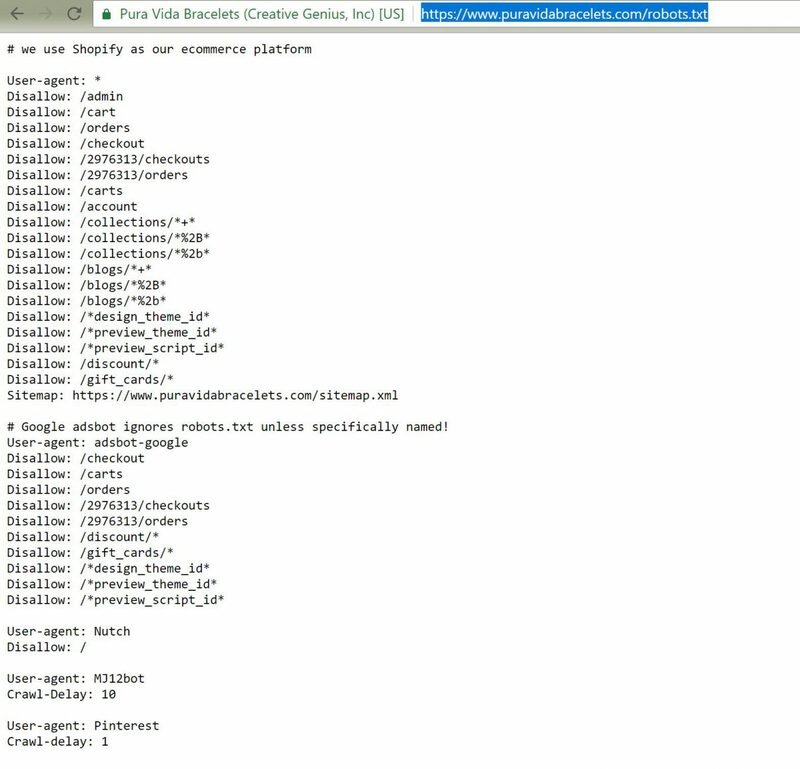 Since our original example included Pura Vida we’re going to continue to pick on them and take a look at their robots.txt file which is located at https://www.puravidabracelets.com/robots.txt. User-agent: This element is used to callout which robot should be following the commands listed below. The “*” in the first User-agent element signifies “All bots”. 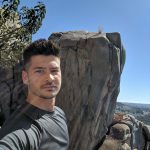 There are hundreds of bots that crawl your website daily, you most likely won’t need to know what they are but if you’re interested here’s a pretty good list of the main ones. Allow: This command tells bots that they are allowed to crawl a URL, even if a previous Disallow command said not to. Disallow: This command tells bots not to crawl specific URLs or URLs with certain elements. Sitemap: This tells bots where your XML Sitemap is located. It’s always good to include this. Bots assume they are allowed to crawl anything until they’re told not to, so for the more basic cases you may never need to specify that a bot is allowed to crawl a certain URL. So why would we want to Disallow bots from crawling specific URLs? Remember when we touched on crawl budget? Like we said before, bots crawl a certain number of URLs and download a limited amount of data before they move on. If bots are stuck crawling URLs that you don’t want indexed in the search results anyways then you’re wasting your crawl budget. You get the idea. Those pages don’t provide much value to people searching on Google, and you definitely don’t want your Admin pages indexed in the search results. After successfully disallowing pages like those listed above bots will spend more time indexing the content you want them to index like your product pages and blog posts. Again, if you’re using a hosted ecommerce platform like Shopify then the XML Sitemap is already taken care of for you, but it’s good to understand how they work to make sure Spotify isn’t including unnecessary URLs in the list. If you’re using the WooCommerce plugin to host your store, then we highly recommend that you install the Yoast SEO Plugin. This plugin will help you edit your page titles, descriptions, target keywords, XML Sitemap, robots.txt file and much more. What is an XML Sitemap? Basically, it’s a list of all of the URLs of your website that you want search engines to crawl and index. When creating a sitemap you’ll have to be careful not to include broken URLs, URLs disallowed in your robots.txt file, outdated pages / products, and other pages that you don’t want the crawlers to index. 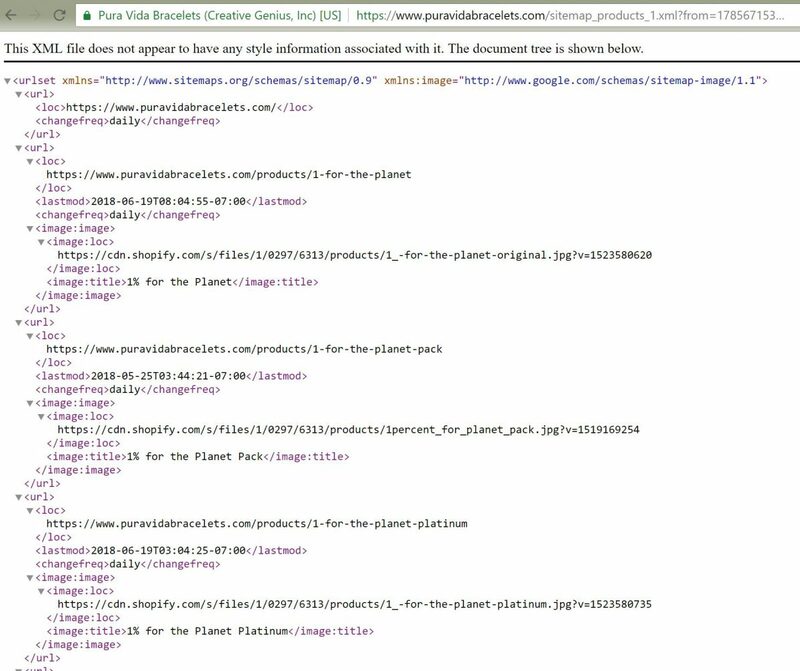 Back to Pura Vida, we saw where their XML sitemap was located by way of their robots.txt file, which is https://www.puravidabracelets.com/sitemap.xml. This is the index of their collection of sitemaps, if you go to that URL you will see specific sitemaps for their products, pages, collections (categories) and blog posts. We’ll focus on one and check out their products sitemap. <loc> – The URL or “location” of that page. <lastmod> – The last time the page was updated/modified. <changefreq> – How often this page is changed / should be crawled. There are many more elements you could add to your sitemaps shown here, but for our purposes the ones used by Pura Vida are more than enough. <loc> and <lastmod> are set automatically and shouldn’t be altered manually. <changefreq> can also contain a default value if the platform you’re using is set up that way, in this case it’s “weekly”. Change Frequency can be set to: always, hourly, daily, weekly, monthly, yearly, and never. We recommend keeping it at weekly for product pages. Chances are you won’t be creating your own XML sitemaps so the info above is just nice to know in case you need to look through your sitemaps for errors. However, there is something you should do with your sitemaps in order to make sure Google gets a chance to check it out. You should ALWAYS submit your XML Sitemaps to Google Search Console. If you don’t have an account it’s extremely easy to set up, especially if you’re already using tools like Google Analytics or even GMail. To submit your XML Sitemap after you sign up, click on “Crawl” dropdown in the left sidebar and then click “Sitemaps”. On the Sitemaps page click the red orange “Add/Test Sitemap” Button and then paste your Sitemap URL into the box provided. Click the blue “Submit” button to finish. Once you submit the sitemap Google will begin to process it. It may take a couple days but Google will eventually begin crawling the URLs listed and provide any feedback or errors that occured during their crawls. Google even provides snapshots of how the bots are crawling your website under Crawl > Crawl Stats. In here you’ll see how many pages the crawlers are crawling and how much time they spend downloading data. If you notice spikes in the time it takes to download data it could mean some new pages are too large, your server response times have increased, your caching needs work, or it’s just a normal fluctuation. 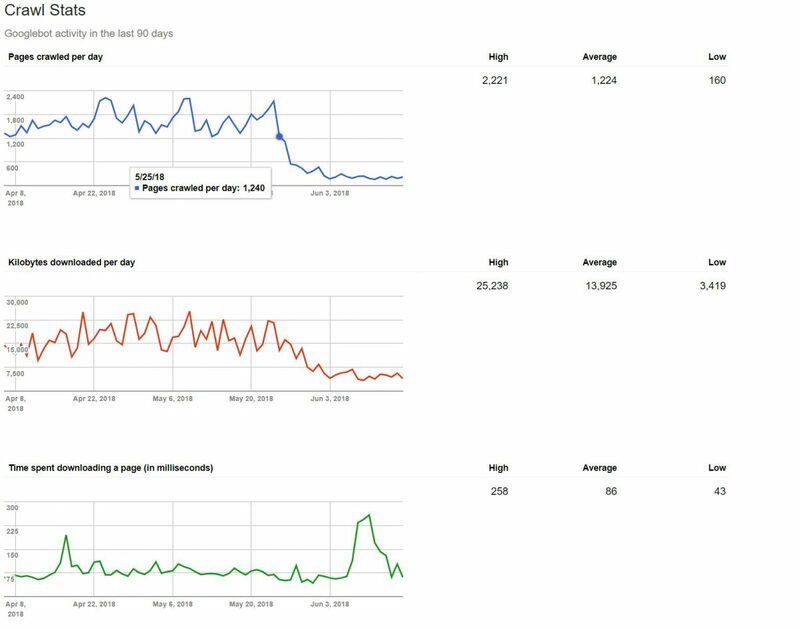 Now that you have a Google Search Console account you should play around with it and check out some of the other data Google is collecting for you such as: crawl errors, HTML errors, search analytics (super cool tool), index status, and much more. Google Search Console is essentially used to provide you with general data on the health of your website. Yet again, hosted platforms like Shopify have your back when it comes to Canonical Tags. However you should still understand what they are and how they work. A Canonical Tag is a simple snippet of code that tells search engines which URL is the “main” URL that is should index, but that’s almost every URL on your website minus those that you disallowed in your robots.txt file earlier right? Not necessarily. To Google, and other search engines, those are two completely different pages. Unfortunately for you as the website owner those URLs feature the exact same content such as product name, product description, pictures, reviews, and more. Now you’re facing a duplicate content issue that can be quite the problem if most of your products come in a wide variety of styles. However, we can use a canonical tag (shown below) on those two sample URLs that point to https://www.coolshoes.com/mens/urban-kicks-mens-shoes/ to specify that it’s the main URL and that the two other URLs are a variety of the same content that should not be indexed. That canonical tag just saved you a potential penalty from duplicate content and it also saved you a ton of crawl budget so that bots could focus on indexing completely unique products instead of thousands of variations of the same product. If your website contains a lot of product variations, inspect your product pages by right clicking (in chrome) and select “View Page Source”. This will show you the code that makes up that specific page, just search for “Canonical” to see if they are already in place. SEO is a continuous process. Just when you think you’ve nailed it something changes and your competitors will begin to out rank you. We recommend viewing reports monthly if not weekly through tools like SEMRush, Google Analytics, and Google Search Console to make sure you’re website is staying relevant to your customer’s search results. Our guide touched on some of the more important SEO elements an Ecommerce Entrepreneur needs to take into account, but there is so much more to SEO than what we’ve mentioned. If you’re looking to expand your SEO knowledge, we recommend checking out blogs like Moz, Kissmetrics, and Search Engine Land.